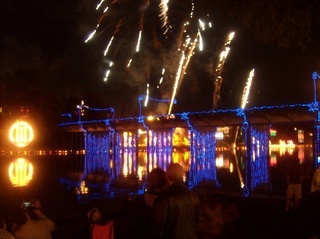 Natchitoches is known for its Festival of Lights, held each year during the first weekend of December. Now, the answer to the first question is hard. Nearly everything I write is autobiographical in some way. There's a little part of me, or something I've experienced directly (or that happened to someone else I know) in all of my work. I always change the story a little, and change the names up. So my characters almost become brothers, sisters, aunts or uncles to me—and sometimes children, though I do have real ones. And the answer to the second question is soooo easy. If you want to be—or become a writer, read. That's right, read everything. Read all the time! Think about the world, and all the other people who live in it! Then you can start creating worlds of your own."